THE engine of Henry Bell's second Comet steamship is on display at Glasgow's transport museum beside the Clyde. The Riverside Museum opened at the end of June 2011 and has proved a huge visitor attraction. Moored alongside is the Tall Ship — the 245 feet long three-masted barque Glenlee, which first took to the water as a bulk cargo carrier in 1896. Glasgow Life operates the museum on behalf of Culture and Sport Glasgow, and because of the demands on their staff in moving to and opening the new museum they did not have the resources to become involved in a substantial way in helping to organise the 2012 bicentenary celebrations. However the museum contains much of interest to Henry Bell enthusiasts, and the engine of the second Comet has a prominent position. This is the vessel which sank with considerable loss of life after a collision near the Cloch lightouse near Gourock. 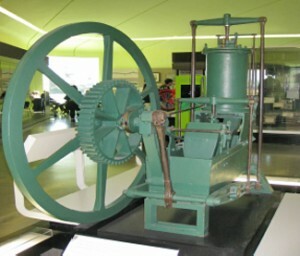 The engines of the first Comet are in the Science Museum in London.